The Missouri man, 33, is locked up for domestic assault after he allegedly used a cardboard roll of wrapping paper to choke his wife during a Christmas Day attack in their home. According to a probable cause statement, Hampton’s wife told police that she “blacked out” during the attack. “The victim had injuries consistent with being strangled,” a cop reported. 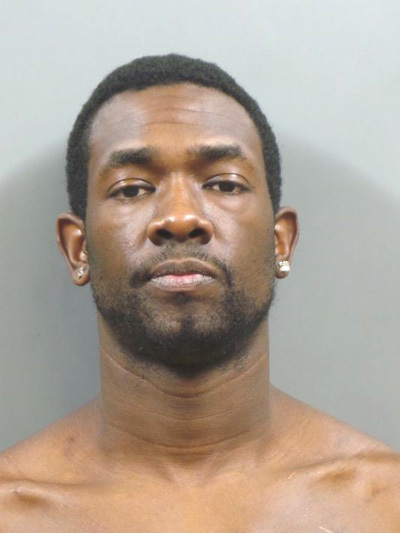 Hampton, pictured in the above mug shot, lives with the victim and the couple’s two children in St. Peters, a city 30 miles from St. Louis. Charged with felony domestic assault, Hampton was booked into the St. Charles County jail, where he remains locked up in lieu of $50,000 cash bail. A judge has ordered Hampton to have no contact with his spouse. Hampton is scheduled for a January 8 Circuit Court hearing.